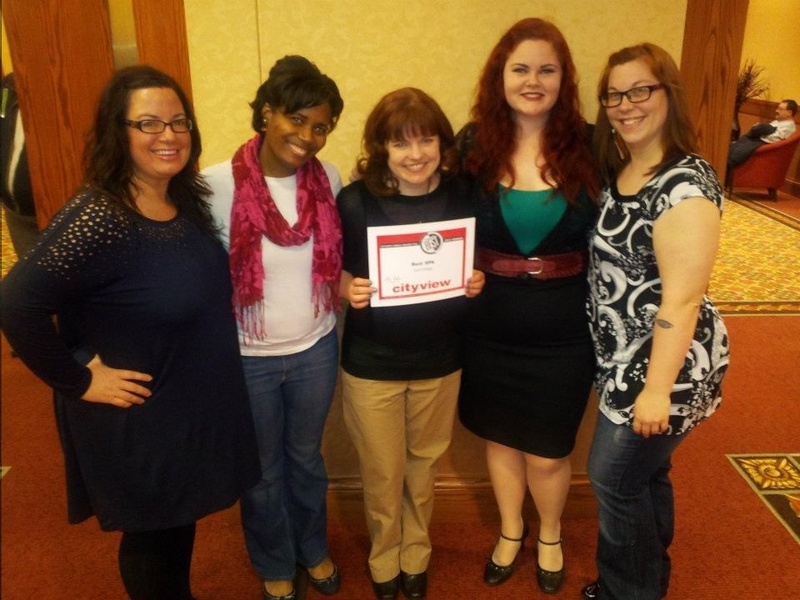 Category Archives: Get to know us better! Corrie Mitchell is a licensed massage therapist and licensed esthetician who joined our team in 2019. 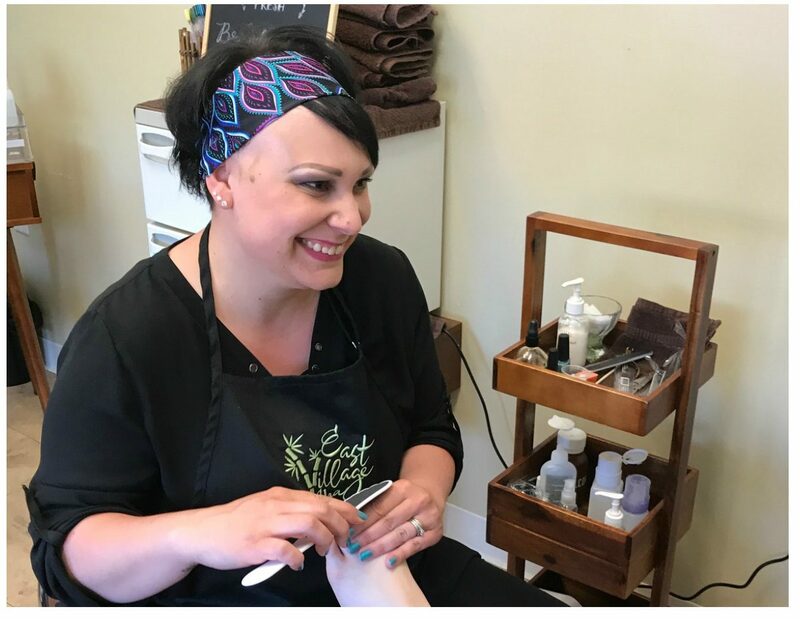 She has her BFA in Theater from Avila University, graduated from the Aveda Institute Esthetics Program in 2014 and from Body Wisdom Massage Therapy School early in 2018. For massage therapy, I specialize in deep tissue, hot stone therapy, relaxation massage and a technique called “positional release” therapy. I really enjoy the relaxing elements of facials. I love helping people look and feel their best. 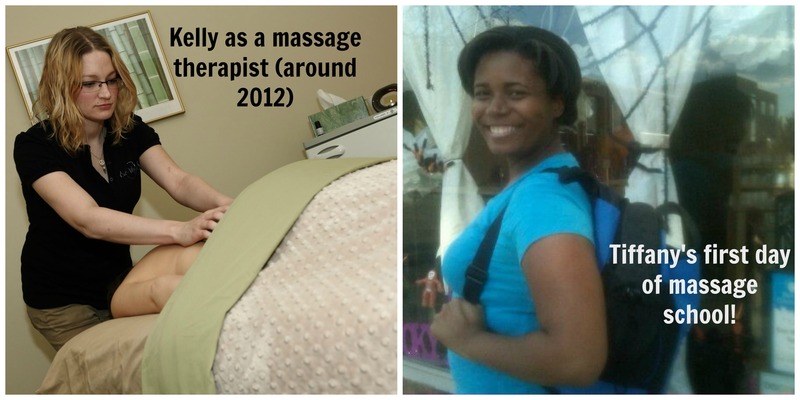 I love that people are realizng the health and wellness benefits of massage therapy. All of them are fabulous! What is your favorite product that we carry? The Farmhouse Fresh body oils smell amazing! Singing has always been a passion of mine. I have a dance background in tap, ballet, and jazz and I love to do Zumba. I also enjoy baking and cooking. I have a passion for helping people look and feel their best. I love providing services that meet their needs. Want to book with Corrie? Click here and be sure to select “Specific Provider” and her name from the drop down menu! 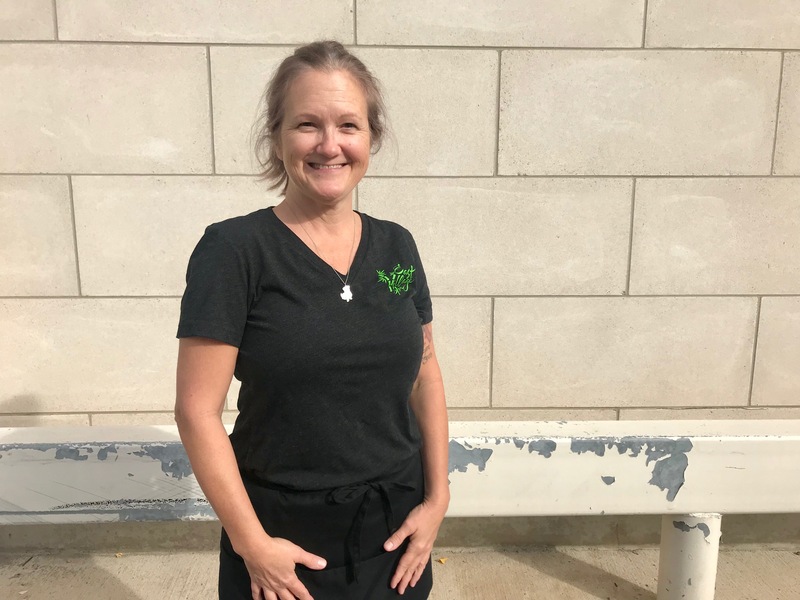 Jennifer Phipps, LMT, joined our team as a full time massage therapist in 2018, but she’s had many years of experience prior to that, including work with several of our massage therapists who were thrilled to welcome her to the East Village Spa crew! I graduated from Body Wisdom Massage Therapy School in 2006 and have worked as a massage therapist ever since! My specialty is truly a mixed bag, but I love working with specific concerns. For example, if someone has limited mobility, I can really focus in on increasing mobility and tracing the muscle back to the original point of trauma. Why did you chose this profession? Honestly, the profession chose me. What are some of your interests outside of work? I’m an aerialist (a beginner), but I love to “fly.” I recently did the 500 mile Carmino de Santiago walk in Spain. I love anything outdoors! Why should guests book with you? I provide a space of trust and my style is relaxing, yet effective. Book with Jennifer online here! If you wish to request her specifically, be sure to choose “Specific Therapist” from the drop down menu, and then her name. We welcomed Kanika Mayes to our team in May 2018. She’s licensed in every service we offer at East Village Spa and comes from a long line of cosmetologists, including her grandmother and mother. A passion for the beauty industry is in her DNA! What are licenses do you hold and where did you attend school? 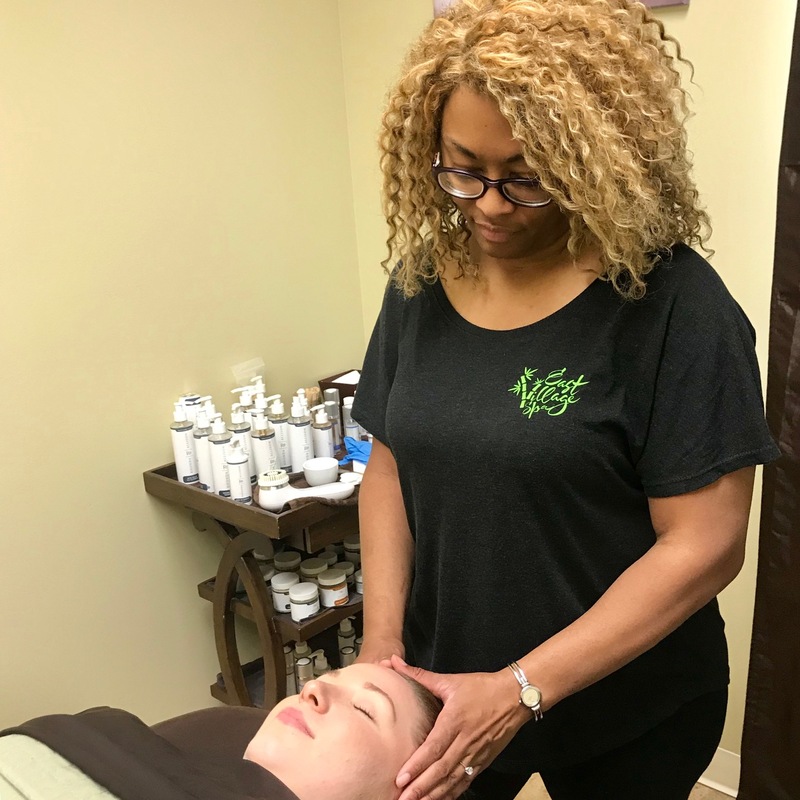 I’ve been a licensed cosmetologist since 2002, a licensed esthetician since 2014, and a licensed massage therapist since 2018. 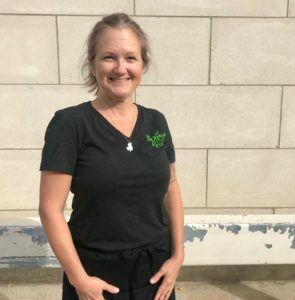 I attended the Iowa School of Beauty in Urbandale for my cosmetology and esthetics training, the Iowa School of Beauty in Ankeny for my massage therapy training, and Aveda institute for my instructor’s license. 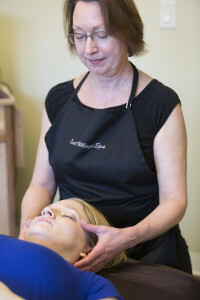 As an esthetician: Facials, facial waxing (I LOVE brow shaping! ), chemical peels, and Hydrafacial. As a licensed massage therapist: Relaxation oriented massages. 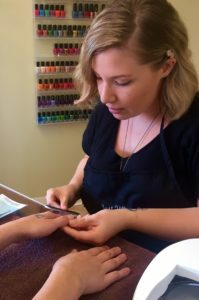 As a cosmetologist I also provide relaxing manicures and pedicures at East Village Spa. I truly believe it is a blessing and a privilege to have a career that helps clients build their confidence through skin and nail care, and relieves their aches and pains through massage therapy. Overall helping people look their best on the outside helps them to feel their best on the inside. Our seasonal massages, because I enjoy the aromas we work with specific to the season. What is your favorite product we carry? This summer, it is the Farmhouse Fresh “Fresh Melon” scented lotion, but it is always changing. I throw AMAZING parties, teach Sunday school, love reading faith-based or inspirational books, and am a huge Denver Broncos fan! Why should clients book with YOU? 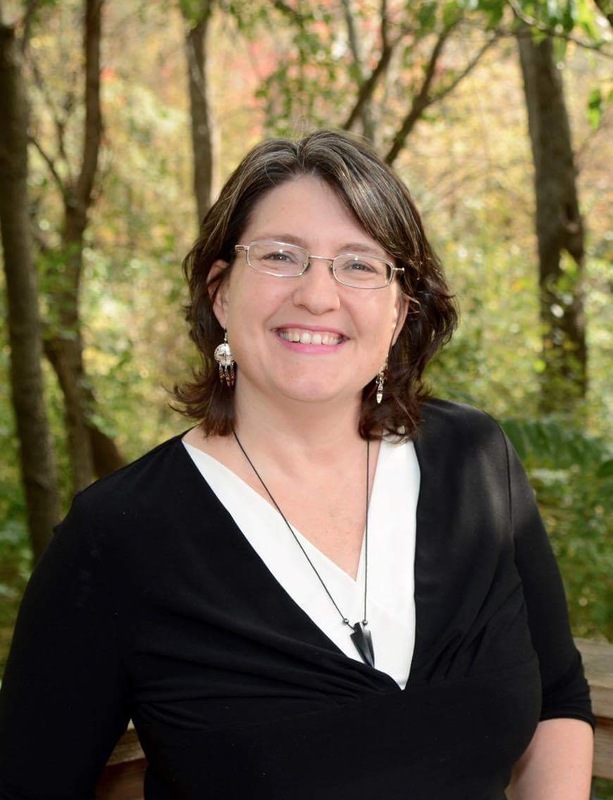 I’m a knowledgeable, patient, and caring professional who is in-tune with my clients’ needs. Book with Kanika online or call (515) 309-2904 to schedule! Get to know Lindsay Crowe! 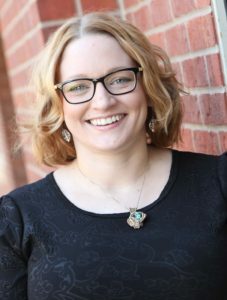 Lindsay Crowe joined our team in 2017 to provide nail, skincare, and waxing services as a licensed cosmetologist and esthetician. Her clients and co-workers absolutely love her kindness, empathy, and random dance moves. I graduated with certificates in cosmetology in 2016 and esthetics in 2017 from PCI. Prior to working in this industry, I worked in healthcare, first getting my CNA training in 2003 from DMACC. Facials and waxing, especially brows and Brazilians. I wanted to be fulfilled in my career and help others feel better about themselves. When I lost most of my hair in my 30’s due to my childhood auto-immune disorder, Alopecia Areata, I wanted to know more and help others like myself feel and look better. I love them ALL! Rapid Fire for pain relief and the Rhonda Allison Skincare line-something for every skin type. 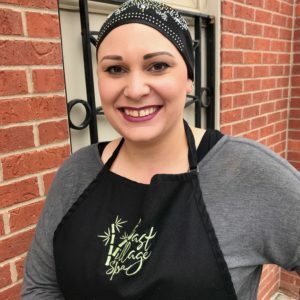 I am a crazy Girl Scout Leader for my daughter’s troop and mom to a boy who believes he is Batman.I volunteer for “Look Good, Feel Better” and the Children’s Alopecia Project. Time with my family is important to me. I will go above and beyond to give you exceptional service. My goal is to make everyone feel the best they possible can. My guests compliment me on being caring and skilled. What are guests saying about Lindsay? If you’d like to book with Lindsay, click here for our website. When you go to book online, choose “Specific Therapist” and then choose her name from the drop down menu to mark your service as are request. I always get a bit sappy on the spa’s birthday. I’m not a parent of human children, but I consider the spa to be my baby. Today the spa is 7 years old and I’ve spent my morning going through old photos and smiling about all the people I’ve gotten to work with over the years. I don’t have any photos of the spa in progress when we were building out the old location, which is a shame because the transformation was incredible. That being said, some of the things we found when remodeling the first location were so horrifying I think it is best that I don’t have lasting images. What doesn’t kill you makes you stronger, right? I wanted to share 7 fun things about the spa for 7 years to mark the milestone. We signed our lease in September 2008, the day before the market tanked! We laugh that when you start at the bottom, there really is only one way you can go! We have been voted Des Moines’ Best Spa every year since 2010! This is a photo of our group in 2011. Our employees stay with us a LONG time, but sometimes switch roles. Our front desk manager Kelly used to be one of our amazing massage therapists. 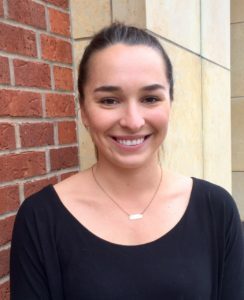 Our amazing massage therapist Tiffany, was our first front desk manager! 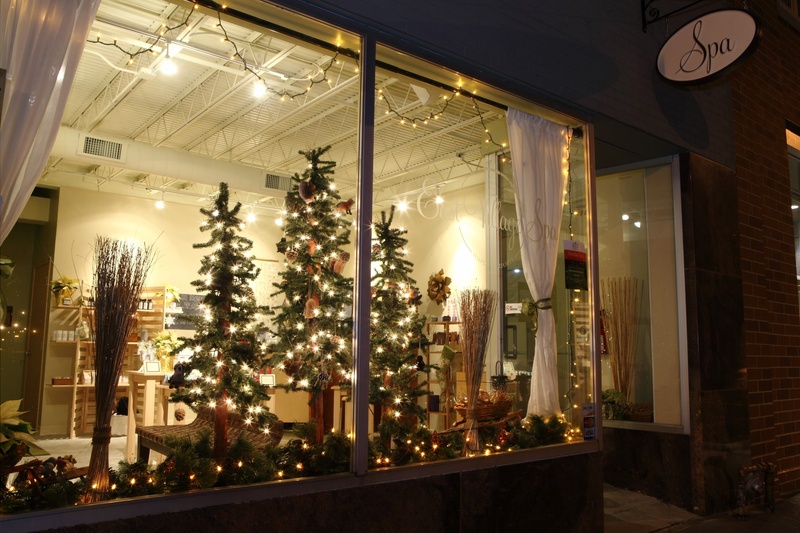 The old spa’s location was too small, had weird restrooms, and no parking, but it did have the prettiest storefront, especially at the holidays. I hit my 10 year anniversary as a licensed massage therapist this year. While I’m mostly handing out chocolate at the front desk (trying to dodge my REAL projects) these days, you’ll still find me filling in for a shift here or there! Me (age 27, seems forever ago!) in my private practice prior to opening the spa. Thank you to all of our clients and employees throughout the years who have made this a fun journey full of such wonderful memories. Here’s to many more years! What is your favorite muscle to massage and why? I took a little survey of our massage therapists to find out what muscle or muscle group they love working on and why. The answers may surprise you! Teresa Sage: Neck/cranial base release because it is such a nurturing area and because the tension ebbs and flows from the neck to the upper shoulders, almost always laden and heavy with tension on most people, especially females in my experience. Allison Peterson: Erectors because of how they run the entire length of the spine and when they relax, we notice that surrounding larger muscle groups will open up with more ease. Tiffany Jackson: The neck muscles because I think that is when people relax the most. Jamee Koopman: The Psoas! For more information about psoas massage, click here. Many muscles in the abdominal area contribute to pain and tension, including the psoas and diaphragm. Clair McClintock: The Diaphragm! It is often a place that gets left out of treatment for many different ailments. For example: radiating pain across the ribs, breathing issues, trauma from an accident, and more. It is not the most relaxing massage but I’ve had so much instant improvement in people’s back pain or some people that have come in with pain they’ve been dealing with for years. It can be a huge emotional release spot for people. Cassie Sampson: The Piriformis. People who have severe pain from sciatic nerve issues can often find relief with massage to the piriformis and surrounding glut and hip muscles. It wasn’t until I had injured myself and experienced the horrible pain caused by a sciatic nerve issues that I knew just how limiting and painful sciatic nerve issues could be and I liked knowing ways to help. The piriformis and gluteal muscles can be treated directly on the skin with proper draping, through sheets or clothing or via stretching. Gluteal and piriformis massage is extremely beneficial. Justin Behanish: The quadratus lumborum (QL) muscle because it it is the cause (or partial cause) of pain in at least 1/4 of the people who have back-pain. I think it is too often neglected by massage therapists. The QL is a small muscle in the lower back that is the root of many peoples’ back pain. Kristiana Moore: The muscles in the feet because many of us stand all day and people find it the most relaxing. When I get to the foot massage at the end of the session, so many people tend to fall asleep! If any of our therapist’s responses are tempting you to book a massage to relax your sorest muscles, click here to schedule online!